If you are looking for a comfortable rocking chair then look no further then this rustic hickory wood rocking chair. This rocking chair is not only extremely comfortable it also is extra room with 2" in height and 3" in width from our standard hickory rocker. 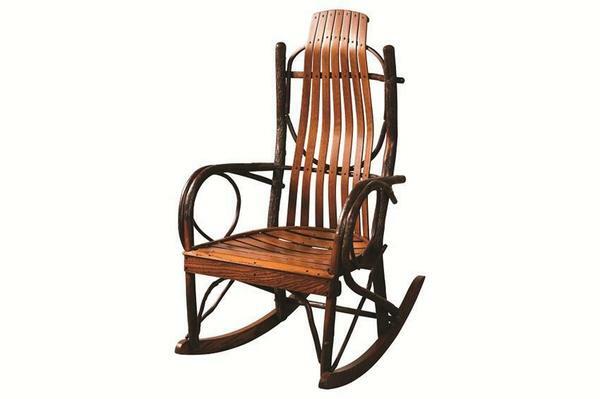 This rocking chair is handcrafted by an Old Order Amish woodworker in a family run business. Hickory wood is one of the most durable and hard woods and will withstand the year to become a treasured family heirloom. You can rock for generations in this rustic rocker. This item takes between 6 to 10 weeks to arrive at your home. It will be well worth the wait. Order online or call to order with one of our friendly sales associates.